There was really only one place that I could visit for this Let’s Do Lunch and that was Nukkad. Don’t panic, all the other restaurants and cafes in Leeds are still open. The reason that Nukkad was on a shortlist of one was that last week, I had the great pleasure of attending the Garbutt + Elliott Yorkshire Food Entrepreneur Awards – and who should win one of the categories but the aforementioned Nukkad. The category in which it was successful was the Deliciously Yorkshire Taste Award (Savoury), so I set off with high hopes of something special. You know what it’s like when you’ve heard great things about a place and your hopes are higher than normal, but when you rock up to try it it is a huge disappointment. Well, this was most certainly not one of those occasions. I can honestly say that Nukkad’s simple street food was as tasty as anything I have ever eaten. Granted it was spicy, but it was the combination of spices rather than the heat which provided the taste. I called it street food but it is in the Merrion Centre, so mall food would probably be a better description. It was also a better option as there were gale force winds blowing outside and I’m not agile enough to chase my lunch up or down Cookridge Street. The origin of the food is North and Central India, so it was a little different from your normal curry house, unless you happen to live in North or Central India of course. The menu is small, but that is no bad thing. I would rather have a choice of half a dozen dishes done well than twenty-five done badly. There are five starters, from which I chose Samosa Chaat at £3.50. The description on the menu is Spiced Potato and Peas Samosa, Topped With Chickpeas, Onion, Dash of Yoghurt, Tamarind Chutney, Coriander and Mint Chutney, Crispy Sev, Fresh Coriander and Chaat Masala. Well, from the first forkful to the last it was superb and every mouthful different. The samosa was nestled in the bottom of a bowl with the chickpeas poured on top, and the dish was finished off with the chutneys, mint sauce, chaat masala and the sev. Sev are those mini spaghetti things that we find in Bombay Mix, so they gave things a crunch. As my fork went through the toppings and pulled out a piece of the samosa pastry, it struck me that this was an Indian version of pie and peas. The chickpeas, however, tasted amazing, with the combination of the mint sauce, yogurt and especially tamarind chutney being a marriage made in heaven. 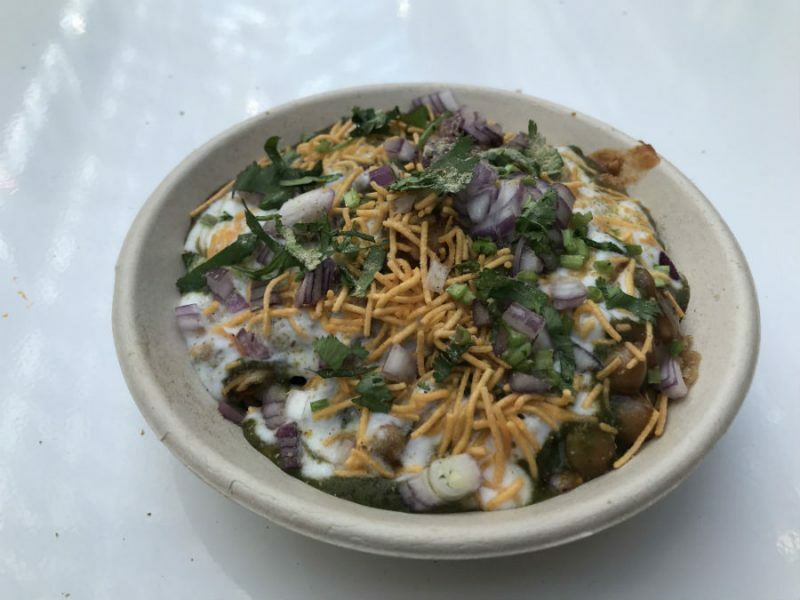 This is comfort food at its best and although chaat means snack, it would have been big enough as a light lunch on its own. Fortunately, I had ordered a main course at the same time so I had to have another treat. Again, the menu contains five items, although the Railway Canteen Lamb was crossed out, leaving one meat and three vegetable options. Because I knew in advance that I would be eating here I had looked at the menu on line and was looking forward to the lamb, mainly because I love the meat and secondly it sounded as though it should be one of those dishes you see sold from platforms in railway stations and passed through carriage windows to the long distance travellers. Anyway, the Dhaba Chicken looked just as inviting, and on reading the menu sounded equally romantic. Dhaba is a roadside restaurant serving local cuisine, so, instead of rail travellers, it caters for road users. The chicken is described as using Nukkad’s unique spices. According to the owner, Abhishek, who I interviewed after his win at the award ceremony, not even the chefs know the blend as they are provided to the two outlets in Leeds and York ready blended. No point in my pinning the young man behind the counter to one of the pillars until he divulged the recipe then. Once you have chosen the base you decide how you want it. There is Kathi Roll (I think I went out with her in 1966) which is an Indian wrap stuffed with your chosen filling along with salad, mint yoghurt, sev and onions. 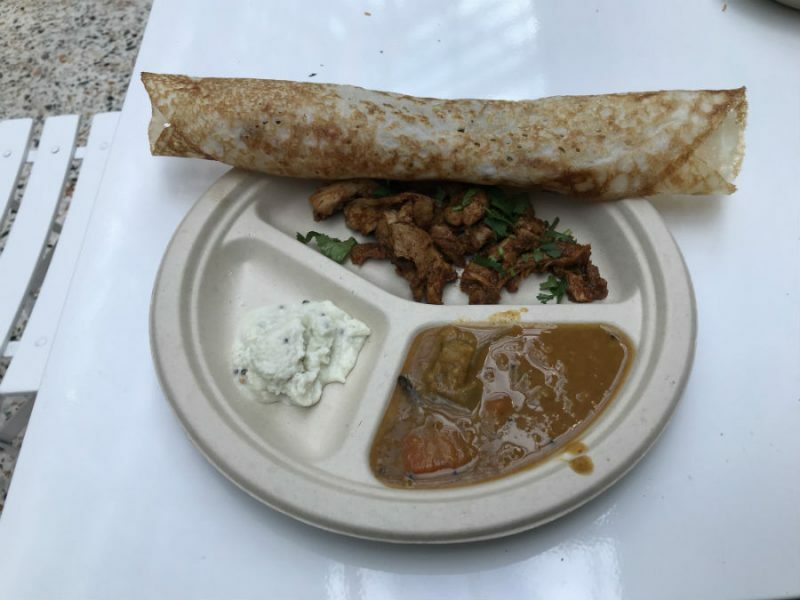 A second version is served on a salad bowl, but I opted for the third, the Rice and Lentil Pancake, or Dosa, Coconut Chutney and Samber, which is Lentil Soup. Once again, a feast for the eyes and the taste buds. The chicken was dry cooked in the mystery spices but lubrication accompanied it in the form of the soup and, a first for me, coconut chutney. Once again, the whole lot was beautiful, cooked superbly and worth every penny of the £6.50. A Diet Pepsi at £1.20 completed the treat. It appeared that though most dishes are bought to take away, there are a couple of tables with chairs should you wish to do as I did and spend a jolly half hour people-watching. A couple of nice touches are the biodegradable cutlery, recycled bowls and napkins and a 15% discount for Students, NHS and Council Staff (Ts & Cs apply). If this is what the winner of the Taste Award produces I am really hoping that next year’s winner also has an outlet in Leeds so that I can indulge myself once again.